American food and wine lovers should take note of Alsace’s charming little town of Ingersheim for two reasons, one food- and wine-related, the other not. The non-oenogastronomic reason has to do with what you’ll be surprised to see as you drive from Colmar, the main city in Alsace’s wine region, to Ingersheim, where you will suddenly find the Statue of Liberty looming up in front of you, right in the middle of the road. That monumental sighting isn’t as surprising as you might first think, because Colmar was the birthplace of Frédéric Auguste Bartholdy (1834-1904), the French sculptor responsible for the beautiful statue of Liberty Enlightening the World; better known as the Statue of Liberty, which was a gift from France to the United States in honor of the centennial of American independence. So finding a smaller-scale copy of the beautiful lady is more than fitting in this setting (though it would probably have made more sense to have it placed within the city of Colmar, but so be it). 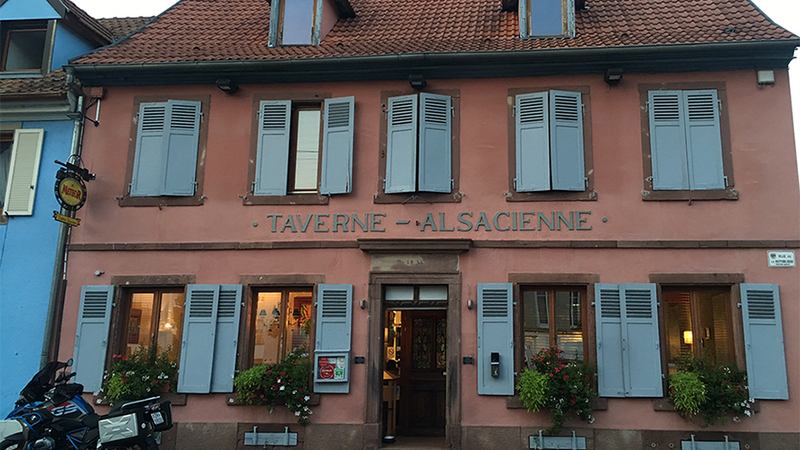 La Taverne Alsacienne is an Alsatian food classic. 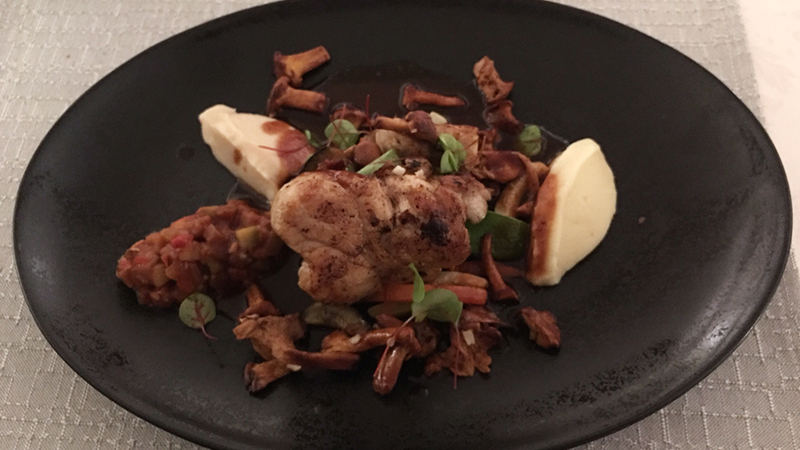 Jean-Philippe Guggenbuhl modestly describes his restaurant as “semi-gastronomic,” but allow me to say that this is a far more “gastronomic” dining destination than many of the world’s much-hyped and far more famous restaurants. Simply put, the sourcing of local and non-local ingredients is first-rate; aromas and flavors are precise and recognizable; and the cooking is characterized by noteworthy culinary ability. There are several prix fixe choices available. The lunch menu, given the quality of the food and cooking, is a steal. From appetizers to desserts, there are no weaknesses. 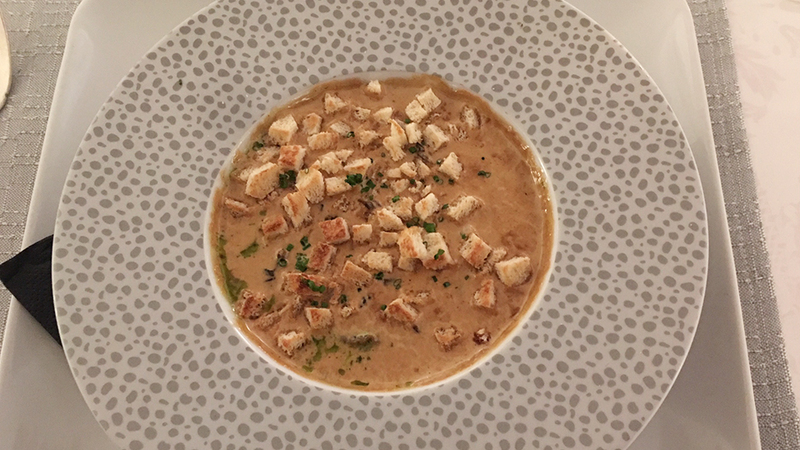 Standout dishes include just about anything involving fish (for example, skrei, salmon, monkfish, pickerel or pike-perch) or mushrooms (one of the Guggenbuhl’s great passions, for which he likes to go hunting himself); the foie gras, escargot and ris de veau dishes are downright memorable. 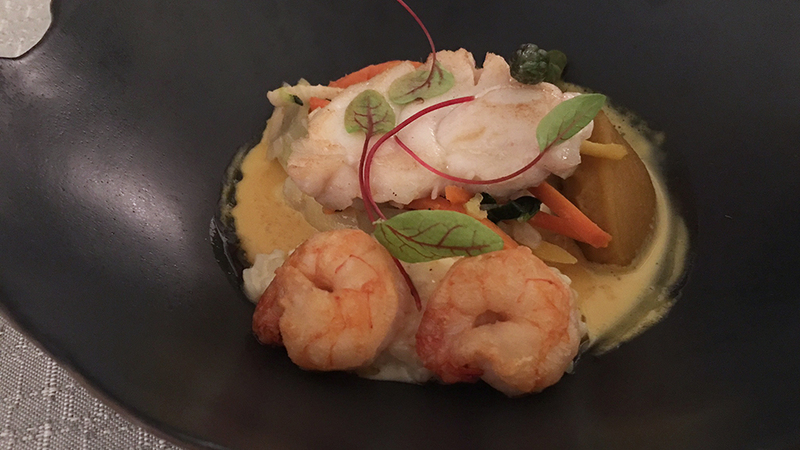 Furthermore, this is not just a temple of regional gastronomy, although those dishes that harken to Alsace’s culinary traditions are, in my view, the restaurant’s best. You’ll find that Alsace classics (foie gras, snails, wild mushrooms, choucroute, Kougelhopf) alternate with crab, scallops and ibérico pork creations on the relatively short, compact men. Add in the fact that La Taverne Alsacienne offers outstanding value, and it’s no wonder the it is a favorite of both foreigners and locals, including the area’s winemakers and estate owners, who come here regularly with their families and clients. In fact, reservations are essential, because the place is usually packed. My latest evening at the Taverne was fabulous. I had one of my best meals there in some time. Snails were delicious, the broth silky and flavorful. The beef was perfectly cooked and the desserts both light and sweet, offering a perfect close to the meal. Dinner seemed to have gone by much too quickly, which is always a good sign. Perhaps what helped make things that much more memorable was an array of excellent wines that accompanied the dishes quite well. The 2016 Domaine de l’Envol Sylvaner Alsace Manala is a lovely wine from a little-known producer just a few houses removed from the restaurant. I am always on the hunt for new domaines anywhere in the world and was happy to come across this one. Their Sylvaner is clean and fresh, though made in a low sulfur-mode that diminishes its vibrancy and blurs the variety’s typical aromas and flavors, which is always a shame. The 2016 Guy Wach–Domaine des Marronniers Muscat d’Alsace Andlau makes a pleasant aperitif and provides varietally accurate if not extremely concentrated or complex aromas and flavors. I follow it up with the 2014 Jean-Marc Bernhard Alsace Riesling Wineck-Schlossberg, which offers gently spicy, broad notes of forest floor, minerals and herbs, lifted by a bright lemony tang. 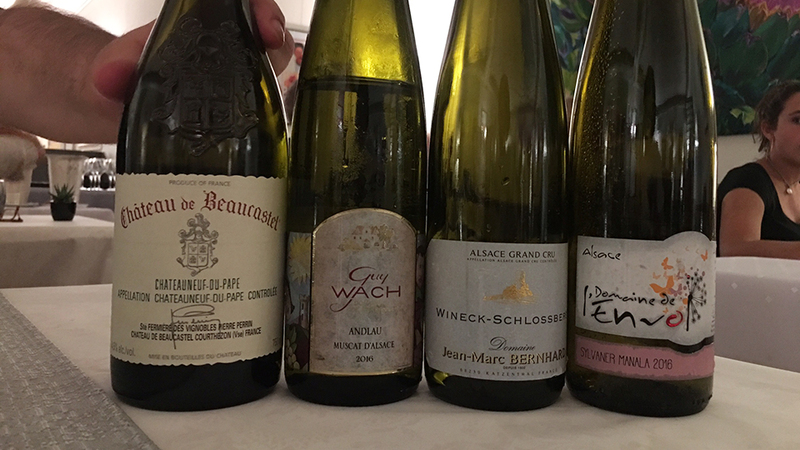 For once, the best wine of the evening during a dinner in Alsace was not an Alsatian white. It’s hard to argue with the simply magnificent 2006 Château de Beaucastel Châteauneuf du Pape Rouge, a masterpiece of refinement and precision. Not at all a blockbuster, but rather a paragon of balance and gracefulness, it offers finely spicy red berry and dark cherry nuances lifted by lavender and thyme. It’s a wine of remarkable clarity and cut. In the ultimate analysis, the Guggenbuhl family can be truly proud of what it has achieved with its Taverne Alsacienne, which is quite simply one of the best trattoria-styled, everyday restaurants you will ever dine at anywhere in the world. The decor is understated, refined and pretty, the tables spaced far enough apart, the ambient noise very reasonable, the service friendly and precise, the food outstanding and the wine list brimming with great buys. My only complaint with the list is that Alsace’s very fine Vendanges Tardives and Séléction de Grains Nobles wines are expensive given the fair prices of all the other wines. That caveat aside, you really cannot ask for anything more from a neighbourhood restaurant that’s affordable enough to visit on an almost daily basis. And that’s exactly what you’ll find yourself doing, should you be lucky enough to live in gorgeous Alsace, or just vacation there for a few days. In fact, chances are high we’ll run into each other there when you do show up.